Eridani at left center of meteor. Today, many astronomers refer to this star as HD 7924, as designated in the Henry Draper (1837-82) Catalogue with subsequent extension (HDE), a massive photographic stellar spectrum survey carried out by Annie Jump Cannon (1863-1941) and Edward Charles Pickering (1846-1919) from 1911 to 1915 under the sponsorship of a memorial fund created by Henry's wife, Anna Mary Palmer. However, it was probably first designated as BD+75 58 in a catalogue that was originally published in 1863 by Friedrich Wilhelm August Argelander (1799-1875) on the position and brightness of 324,198 stars between +90° and -2° declination that were measured over 11 years from Bonn, Germany with his assistants Eduard Schönfeld (1828-1891) and Aldalbert Krüger (1832-1896). The catalogue became famous as the Bonner Durchmusterung ("Bonn Survey") and is typically abbreviated as BD. It was later expanded and extended during the early 20th Century with the Cordoba (observed from Argentina) then the Cape Photographic Durchmusterung (observed from South Africa). HD 7924 is an orange-red main-sequence dwarf star of spectral and luminosity type K0 V (Howard et al, 2009; and ; and NASA Star and Exoplanet Database from HD Catalog). The star is estimated to have around 83 percent of Sol's mass (Takeda et al, 2007), around 78 percent of its diameter (Takeda et al, 2007), and 37 percent of its bolometric luminosity (Valenti and Fischer, 2005; and NASA Star and Exoplanet Database, derived from Kenneth R. Lang, 1980). It appears to be only around 71 percent as enriched as Sol in iron relative to the abundance of hydrogen (Valenti and Fischer, 2005). HD 7924 appears to be around 3.6 billion years old and and a rotational period of around 38 days (Howard et al, 2009). Useful catalogue numbers and designations for the star include: Gl 56.5, HD 7924, Hip 6379, BD+75 58, SAO 4386, and Wo 9054. On January 29, 2009, a team of astronomers released a pre-print which reported on the discovery of a "super-Earth" around this star (Howard et al, 2009). It was found using eight years of radial-velocity measurements from 2001 to 2008 as part of the the NASA-UC Eta-Earth Survey by the California Planet Search (CPS) group, a systematic search for low-mass planets between three and 30 Earth-masses orbiting the nearest 230 G-, K- . and M-type stars suitable for high-precision Doppler observations at the Keck Observatory. 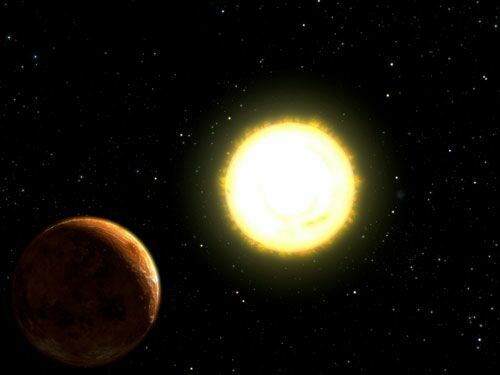 Planet "b" has at least 9.26 Earth-masses and an orbital period of 5.40 days at an average orbital distance of 0.057 AUs, which is well within the orbit of Mercury in the Solar System. The orbit has a mild eccentricity of e~0.17± 0.16. Transit observations failed to detect any companion objects. The following table includes all star systems known to be located within 10 light-years (ly), plus more bright stars within 10 to 20 ly, of HD 7924. Up-to-date technical summaries on HD 7924 can be found at: Jean Schneider's Extrasolar Planets Encyclopaedia; the Astronomiches Rechen-Institut at Heidelberg's ARICNS, and the NASA Star and Exoplanet Database. With its stars shaped in a "W," this northern constellation was named by the Ancient Greeks for the mother of Andromeda who claimed to be more beautiful than the daughters of Nereus, a god of the sea. Cassiopeia's vanity so angered the sea god Poseidon that he had Andromeda chained to a rock of the coast as a sacrifice for Cetus (the monstrous whale) until Perseus rescued her. For more information on stars and other objects in this Constellation and a photograph, go to Christine Kronberg's Cassiopeia. For an illustration, see David Haworth's Cassiopeia.